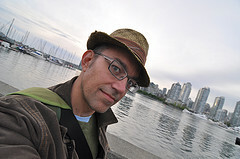 Self-portrait of Derek K. Miller, May 15, 2010. Licensed CC-By-NC. Original image at http://www.flickr.com/photos/penmachine/4613226120/in/photosof-penmachine/ .